In 2017, we are approximately one century past the initial conception of Quantum Theory. Yet its implications have not reached our most general, common sense understanding of the universe. Quantum Theory will change the way that we understand reality, our relationship to the environment, fellow humans and animals. It will fundamentally change the way in which we think about art. Quantum Theory is a theory as profound as the Copernican Revolution: the revolution that told us that Earth is not the stationary center of the universe. What a shock! Today we have a new shock. The Quantum Revolution is here. Quantum Art explores the artist’s relationship to art, in the midst of the paradigm shift between a Newtonian and Quantum World View. 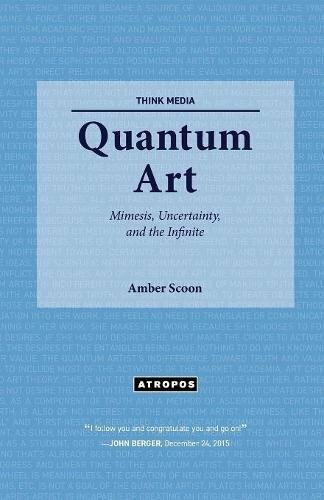 Quantum Art suggests an opening, in which art can become itself. Quantum Art suggests that mimesis is a creative, becoming activity. Mimesis is not a performance in which we copy the known, singular world. It is an activity of observing the uncertain and creating the uncertain. The world itself, a quantum world, is uncertain, potential and infinite. The Quantum Artist plays with her desire to create her world through observation. Amber Scoon is an artist and philosopher from Pelham, MA. She received her BS from New York University, her MFA in painting from American University's two year program in Italy and her PhD in Philosophy, Art and Critical Thought from the European Graduate School in Switzerland. Amber is the John Berger Fellow at the European Graduate School and a Professor at the Institute for Critical Philosophy at the Global Center for Advanced Studies.